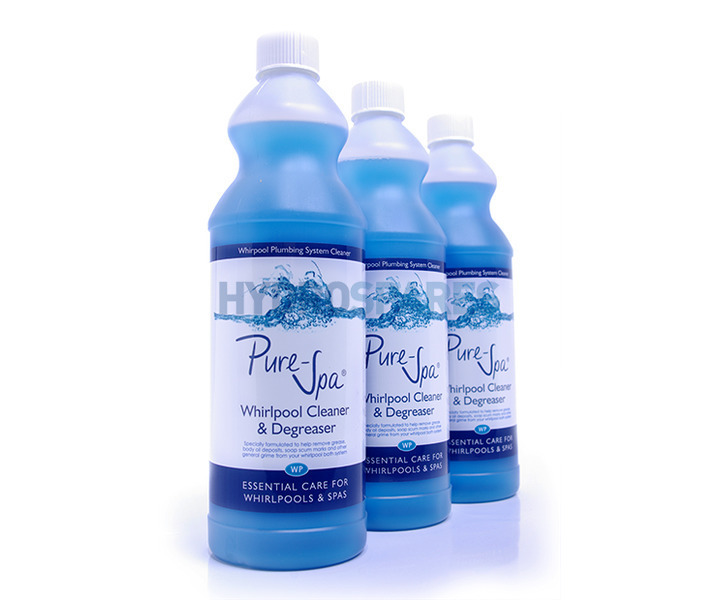 Pure-Spa Whirlpool & Spa Bath Cleaner is specially formulated to help remove the build up of grease, body oil deposits, soap scum & general grime & slime from your whirlpool system pipework & pump. It is essential to regularly clean and sanitise your whirlpool bath in order to minimise the growth of bacteria and to control the build up of bath deposits that can accumulate in the pipework. This product can be used at different dilutions depending on the level of cleaning required. Some foaming will occur so never leave unattended, always close the air valve/turn to minimum. Safe to use on Chrome, Brass, Gold Plated. Natural use of a whirlpool or Spa bath will cause the system to become polluted over time, this can be due to the build up of soaps, bath additives, grease & body oils etc that can build up inside the pipework & fittings. Pure-spa 'Whirlpool cleaning fluid' helps to clean the whirlpool system in a hygienic manner, & is specially formulated to help remove the build up of these pollutants from the system. In between cleaning applications the regular use of Pure-Spa 'Sanitising tablets' will help to treat your system effectively to minimise the growth of bacteria, thereby leaving your system fresher & more hygienic after each use. Used correctly & regularly Pure-Spa products will ensure your whirlpool bath remains cleaner & fresher!